The Hawkeyes will travel to Stevensville Lakeshore’s home turf Friday night looking for a win to secure them a spot into the third round of the Division III playoffs. The team lost to Zeeland West in five games to end the season Tuesday, Oct. 30. Hamilton senior Taylor Johnson talks about her experience at the state finals and her future playing golf. 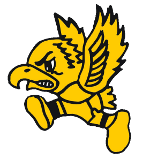 Despite four turnovers, the Hawkeyes were able to outscore the Eddies by four touchdowns. Coach Pertner said that Molly Oren and Cathy Coryell look to place well at the state meet on Nov. 3. The Hamilton varsity football team will travel to Edwardsburg High School for the first round of the Division III State playoffs on Friday night. With Hamilton’s team score of four points, it became the best finish for the Hawkeyes in many years. The men’s varsity cross country team ran to a 4th place finish in the OK Green at their conference meet on October 17.